The creation of the Irish Free State in 1922 was partly driven by a popular desire to delineate a distinct national Irish identity. The formation of the Irish Folklore Commission in 1935 can be traced to this movement. Strong links forged with Scandinavian (especially Swedish) tradition archives at this period were central to the Commission’s success. 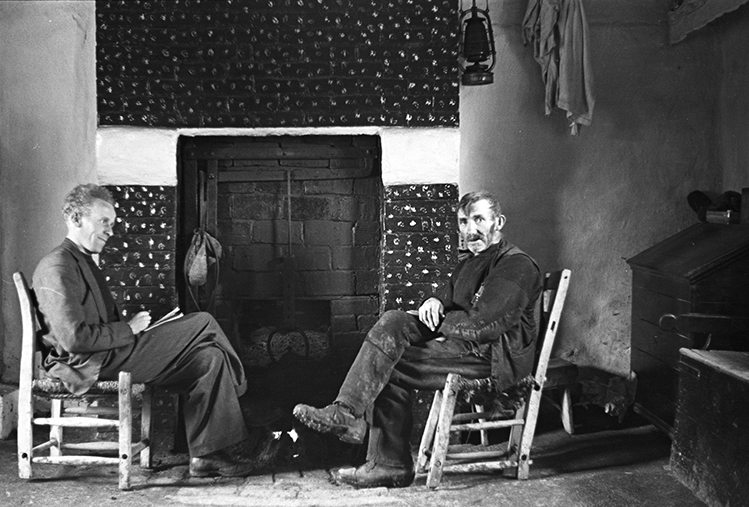 Much of the archival material in the National Folklore Collection was amassed by its forerunners, the Irish Folklore Institute (1930–1935), the Irish Folklore Commission (1935–1971), and the Department of Irish Folklore UCD (1972–2005). Since 2015 the Collection resides administratively within UCD Library. The audio and film recordings, manuscripts, and rare printed materials in the Collection span many aspects of material culture, oral literature, language and the Arts. The Main Mss Collection comprises more than 2,400 bound volumes of interviews, in Irish and English. The Schools’ Mss Collection is the outcome of a national project (1937–39) in which schoolchildren recorded more than 750,000 pages of folklore. The Sound & Video Collection features some 12,000 audio recordings, including a large number of early and modern field recordings. The NFC is home to more than 80,000 archive photographs as well as numerous paintings and drawings. The Irish Folk Music Section of the NFC features a large collection of audio recordings, manuscripts, and books dealing with music, song, and dance.